The Congress leader said the general sentiment in the party was that the time had come for Rahul Gandhi to take charge. Sachin Pilot Pilot said that Rahul Gandhi's elevation had been in the pipeline for long. 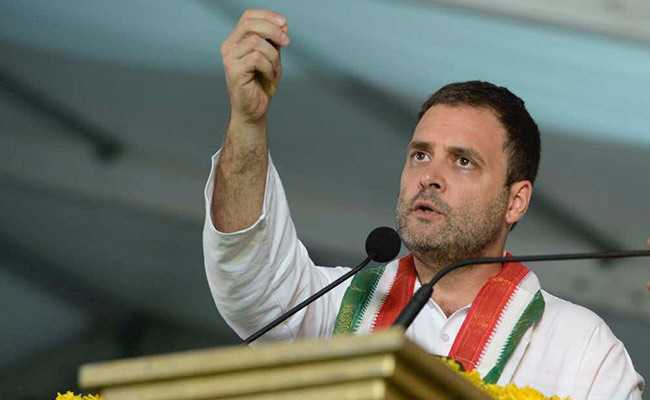 New Delhi: Rahul Gandhi may take over as the Congress president shortly after Diwali, Rajasthan leader Sachin Pilot said today, stressing that the time had come for the party vice president to lead from the front. The Gandhi confidant also said the last names of leaders should not be treated as a disqualification in politics. It was the performance of a leader that ultimately decided his worth, as a surname could only take him "so far", he said. Mr Pilot added that Mr Gandhi's elevation had been in the pipeline for long. "Organisational elections of the Congress are underway and the new president could take over shortly after Diwali. It is something that has been in the pipeline for a long time," Mr Pilot told PTI in an interview. The Congress leader said the general sentiment in the party was that the time had come for Mr Gandhi to take charge and lead from the front, while favouring a "balanced approach" of a mix of the young and the old in the party. "To my mind, there is a general sentiment in the party that he should take over as the party president," Mr Pilot said. He pointed out that Mr Gandhi had been handling "a lot of work" as the vice president but the party believed "this (Gandhi's elevation) should happen in due course and the time has come for it to happen". Asked if Mr Gandhi's sister Priyanka Vadra should also enter active politics, the former minister said, "Though she belongs to the Congress party, whether she should join active politics or not is her personal decision". On the issue of dynastic politics and accusations that the Congress promoted dynasties, Mr Pilot said belonging to a political family might help someone initially but it could not guarantee progress unless backed by performance. "Belonging to a family that has been in politics should not be treated as a disqualification," he said. Ultimately, he said, success depended on performance. "If you perform and win the hearts of people through work, delivery and performance, then it will decide. The mere last name will only take you so far," said Pilot, the son of late Union minister and Congress heavyweight Rajesh Pilot. He brushed aside BJP criticism that the Congress was promoting dynasties, pointing out that several people in that party too were from political families. "The BJP should introspect. Many of their leaders are also from political families," he said. Mr Pilot added he neither promoted nor denounced dynastic politics, but sought to stress that individual calibre would decide one's success. "It (family) should not be the only reason to bring someone into public life. No one can be thrust upon the public and there is no short cut to hard work," he said. Asked if the time had come for a generational change in the Congress and for the old to make way for the young, the Rajasthan Congress chief said, "It is not a question of making way; it is a question of working together". The "cut-off date" system did not work in politics, he added. Unlike the BJP, which he claimed "humiliates" its elders, the Congress uses their wisdom and moves together, he said. "The BJP's margdarshak mandal has become the biggest travesty of time. We don't humiliate elders like (they do) in the BJP. I believe we should have a good mix between the old and the new while one must keep changing," he said. In the Congress, he held, the new generation comes in, with the old lending their support to it. He favoured a "balanced approach" and claimed the Congress had maintained this as part of its history and tradition. Mr Pilot also hit out at the BJP, saying that a particular ideology should not be thrust upon others and there should not be any hatred in politics. "One should have competitors and not enemies in politics and we must respect that basic tenet of democracy," he said.